I have received a few e-mails from concerned readers asking if I were taking a hiatus. While there is no challenge for February, I am not taking a formal break. I have been unable to focus enough to sit down and formulate a post. I spend the end of January and majority of this month in transit between Maryland and Delaware. 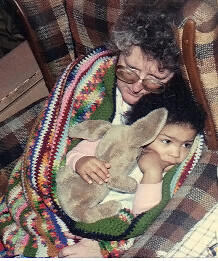 My Nanny had fallen ill and consequently passed away last Saturday, 2/9/2013. Nanny was my maternal grandmother. She was the matriarch of my family. Her word was final during familial affairs. Thanksgiving, Christmas, and any other events were always hosted at her house. While programing a VCR or DVD player was an impossible task for her, if there was an issue Nanny had an answer. She was always there for us. And sometimes had to tell us the hard truth when we needed to hear it. She was a simple woman. She did not need pearls or foreign vacations to make her happy. A phone call or an animal greeting card ment the world to her. She never had big aspirations. She just wanted her family to be happy. Like any other veteran she was incredibly tough. And if she want something there is no talking her out of it. It hurts that she will not be there whenever I walk down the aisle, whenever Oppa and I have children, or laugh at me when I complain about getting old. I was Nanny's only grandchild. I was the light of her life and her baby girl. She marveled at every of my academic achievements, supported my every decision, and loved me unconditionally. Nanny you will always be in my heart! We're so sorry to hear that. D': she sounded like such a wonderful person! hope you feel better soon.